Two months of snapping my #everydaystyle shots done and dusted! Why is she taking daily pictures of herself and uploading them to Instagram? More about that here. Anyway, let me just say photographing my daily outfit has become very much a normal part of my day. I wake up, drink a coffee, shower, dress, photograph myself, upload the picture and zoom off to work. It’s no longer something I have to remind myself to do – it’s routine! They say you can make or break a habit in a month and I totally agree. And I actually really enjoy the feedback and questions about where I’ve purchased certain items, and the conversation it creates. I love helping people out, and if my simple responses can inspire them than I am one happy lass. I shared January’s top outfits here and I wanted to do the same for February. A shorter month (I actually missed my first daily snap of the year oops), I found myself steering away from the black and white of work wear I previously focused on in January and added some more colour and prints to my 9-5 choices. Casual dressing wise I spent a lot of time in versions of denim on the weekends in February (coming soon to the blog). Perhaps it was the lazy-ish month I had, but it worked. Here are my top rated work outfits I wore in February (play coming soon). I hope I inspire you to inject a colour, pattern or piece into your work wardrobe this season! 1. During February I played along with Vanessa of Style & Shenanigans five day #SNSColour fashion challenge via Instagram, and this work outfit was actually inspired by “metallics”. I don’t usually wear a lot of jewellery to work (besides my rings and earrings) so I decided to up the ante a little and add a silver and green statement necklace from Kmart to my plain-ish Dotti striped peplum and Target black skirt combination. It’s funny how a statement piece of bling can truly change an outfit for the better. Do it, I dare you! Statement jewels don’t have to wait for the weekends. 2. I don’t normally wear a lot of pink tones but this vintage dress and belt combination felt like the best choice for another day at work when I woke up that morning and saw I’d been featured on the Nikki from Styling You‘s blog. Wow! She mentioned in her post about “Instagrammers To Follow For Style Inspiration” that she loved my collection of waist hugging cute dresses so of course I had to wear one to work after I read that! I paired the dress with cute white wedges from Kmart. 3. I was actually quite surprised anyone actually “liked” this particular work outfit, a striped skirt I live in from Kmart paired with a layered lace shell top from Ally. The top is quite boxy when it isn’t tucked in so I thought I’d tuck it for a change (and to add a bit of shape to the look). Tucking things in elongates your body and enhances your natural curves. Pity the top spent the entire day untucking itself! Fail! 4. I’m actually obsessed with this blue vintage midi I found at an op shop in the suburbs. The pleating is very on trend, the length is modest for work and the colour is even more lovely in real life than it is in this picture. I can’t count how many people (on and offline) have asked me where I found the skirt, and I’m sad I have to tell them they can’t have it! 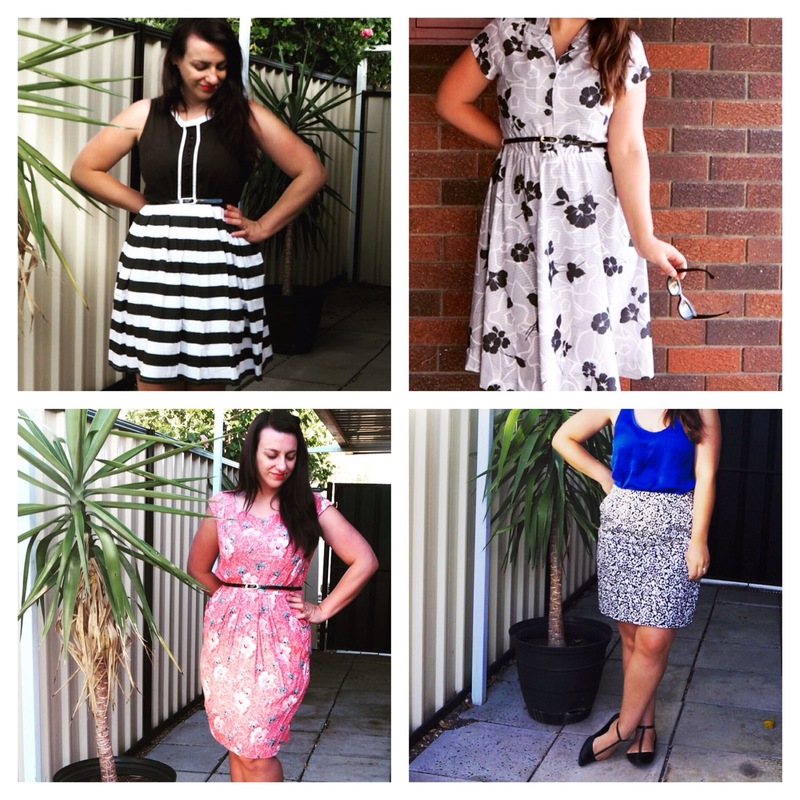 Op shop tip time – scout every rack, even the plus sized racks. Vintage sizing was extremely different to our system these days, and this skirt is actually a size 18 of yesteryear. I’m not a size 18 and it fits my waist like a glove. Try everything on – you may find a winner. The Elliatt top I wore with my skirt was once a gifted dress from a friend that I actually cut up (scandalous) to make a top! Originally it was such an awkward length that I had to do something with it, but I couldn’t part with it. Snip! 5. This dress may be black and white but the bold print is eye catching and really brightened up a recent Monday morning! Joining in on the #monochromemonday hashtag this Dangerfield dress is practical yet fun and worked well for a cafe catch up with a friend followed by an afternoon at the office. Versatility in your pieces is so important! 6. More vintage, more florals, more midi lengths and more monochrome. Since rediscovering this dress in my wardrobe a few months back I can’t get enough of it. I love that I can comfortably wear it to work without worrying about the length or cut. Plus it’s retro cute, which is my favourite kind of cute! 7. Another entry into Style & Shenanigans Instagram colour challenge – this time the prompt was “bright”. This Leona Edmiston dress is certainly bright enough! I paired the loud dress with simple Kmart wedges (I’ve lived in them this Summer), a bright red lip and my trusty Forever New black waist belt. This dress is a little big but by adding a belt the fabric is pulled in creating a better fitting look. Try the trick, you’ll be surprised! 8. Combining prints and bolds for this midweek work look! I love jazzing up a monochrome print by adding a pop of colour. Blue is my favourite and looks great with most other colour combinations. This Dotti tank is ancient but lifted my Target work skirt up 6532 notches. Another trick for you to try at work this month. – Statement jewellery isn’t just for the weekend, it can really take your work look up a notch! – Try new colours you don’t normally wear, you may fall for them! – Tucking shirts and tops into your pants or skirt makes you look 10 times smaller, and more well put together. – When op shopping for wear wear (or anything really), try everything on and don’t trust the sizes on the label, especially when it comes to vintage wear! – Versatile pieces are the basis of a good work wardrobe, even better if you can take them from work to play! 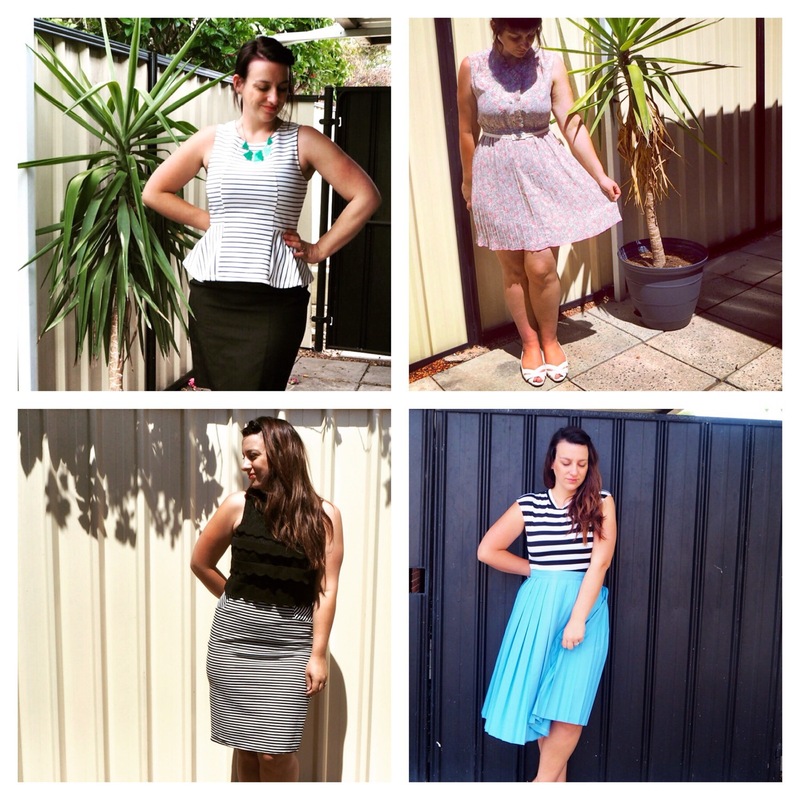 – Dig around in your wardrobe, you may find a gem (or five) you’d forgotten about! – Adding a waist belt instantly makes you look trimmer and adjusts any ill fitting clothing. – Mixing colour and prints is a fab way to get noticed! Beautiful pics, love THEM ALL. Hahaa do it ! I have asked colleagues in the past – lol ! I love taking daily #everydaystyle photos it has really helped me evolve my style and also to see what really suits me. Also seeing what others wear helps me to step outside my safety zone. I know what you mean with taking a picture each day becoming a routine! 🙂 It’s something I always do before I leave the house now, second nature. I manage to make time for it most days. I love looking at everyone’s #everydaystyle photos on IG! I get so much inspiration from those photos! Me too! More inspo for shopping ha!